Big, bad and retro to the core, the Dodge Challenger worships horsepower and open roads. The baddest kid the Challenger Class of 2012 is the new SRT8 with its adult-delinquent attitude and the snarling 470 horsepower of its HEMI V8 engine. Dodge challenger rt: the 'family" muscle car! 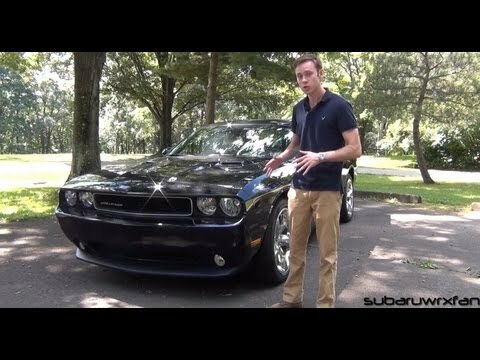 I drive a 2012 Dodge challenger rt equipped with a standard six-speed and a 5. 7l 375 hp engine which has plenty of power, enough to make driving a thrill and transform the vehicle into a cop magnet. Alcohol consumption is not an option, but who needs it with a ride this sweet. Interior is roomy enough to keep the grandkids comfortable and the wide tires are surprisingly effective in the snow--we drive it year round and use it as the family car. The sight of grandma rumbling up to drop off/pick up her grandkids in a muscle car, rolling stones blaring, our black lab sticking his head out of the moon roof, creates quite a stir at local daycare providers and schools. Beautiful eye and ear candy. I enjoy the lines of the vehicle, I also enjoy the comments I get from people when I go drive it around. It would be nice if the aftermarket parts would be cheaper. The only thing other than tires and a new door module going out it's a very solid beefy car that takes a few days getting used to how it drives and handles and how you can push it. Overall good vehicle only problem is the seats can be a bit uncomfortable. But my vehicle was able to drive for 10 hours when I moved. Great radio, great size. It is 6 years old and overall handles quite well. It is also very spacious and was able to carry loads of boxes from my move and only needed to stop for gas 2 times.